It’s been a while since we’ve had a newborn in the house and I must say, I’ve really enjoyed shopping for our newest little addition! There are so many modern baby products in aesthetically pleasing colours now compared to 9 years ago when we had Austin. It’s refreshing to see neutral and muted tones that actually fit with our home decor rather than all of the typical primary colours. 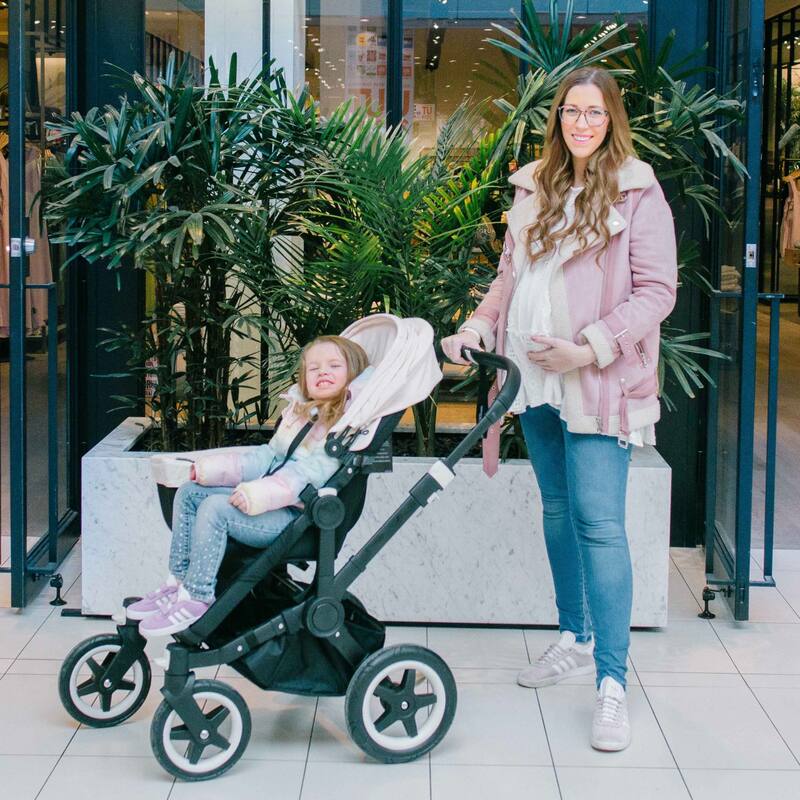 I’ve been getting a lot of questions about our favourite baby items so I thought it would be fun to curate a list of the 25 best baby products we found on our shopping adventures for you! They’re all perfect for the millennial Mom who loves neutral decor or more of a muted colour palette. Feel free to ask me questions about any of these items as we own all of them so I can answer honestly. Some of the products we’ve used for years and swear by and others are new products (or new to us) that we’ve recently purchased. 1. Bugaboo Donkey 2 duo stroller – This stroller has been on our wish list for YEARS. Is it pricey? Yes. Is it worth the investment? 100%! I don’t think you need to splurge on most baby items because, let’s face it, it gets expensive BUT you will be using your stroller for years so it’s definitely one of those items you’re better off investing in. We’ve had two previous strollers that were mid-range in price and they don’t even begin to compare to the Bugaboo Donkey 2. Not only is it lightweight and easy to maneuver but it has so many cool features. My favourite is that you have the option for storage on the side of the stroller where you can keep your diaper bag. It’s so much easier to access the things you need rather than trying to dig around for them in the crammed basket underneath. This stroller has so many other features that we love but I’ll dive into those in a separate blog post down the road! 2. Llama Teether – Ok, is this not the cutest thing? Lulu Lollipop carries THE most adorable teethers for baby. They have tacos, Oreos, bunnies – the works! Definitely check them out for silicone teethers because I have yet to find a company that carries cuter ones than these. 3. Soother Clip – these are also from Loulou Lollipop. Their soother clips are made of wood or silicone or a mix of both. They come in modern colours and are oh so adorable. 4. Baba Tree Moses Basket – I was looking for a Moses basket for our little guy and asked my readers on Instagram stories if they had favourite brand that carries them and Baba Tree was one of the most recommended. The company is new to us but we are so happy with the quality of their baskets and excited for our baby boy to enjoy his. They’re ethically sourced and handmade in Africa and they truly do an amazing job. 5. Muslin Blanket – These are so soft and highly recommend for baby. I actually prefer using these over receiving blankets. I’ve linked the one pictured but we love a few brands that carry them like: Loulou Lollipop, Little Unicorn and Aden & Anais. 6. Dresser – We really wanted to keep with the theme of our home for baby furniture and fell in love with this dresser. I love the modern feel and mix of white and natural wood. It’s also equipped for a change pad on top. 7. Snuggle Me Organic – this is a sensory lounger that pulls close to baby giving them the feeling of a hug. They fit perfectly in a Moses basket and keep baby nice and cozy when you need your hands free. They have a wide variety of cover colours that are both modern and beautiful! 8. Car Seat – Safety ratings are the first thing we look at when it comes to car seats – obviously that’s the most important thing to consider when making your selection. The Nuna PIPA not only has a great safety rating but it’s sleek and modern design is perfect for the millennial mama. It looks nice and cozy and can easily work with most strollers with the purchase of an attachment. 9. Crib – The matching crib to the dresser. Again, we love the modern feel and mix of white with natural wood. The crib also converts to a bed once baby outgrows their crib. 10. Towels – these towels are 100% cotton muslin and incredibly soft. Perfect for drying baby off after bath time. Copper Pearl has so many gorgeous prints for both boys and girls so be sure to check them out, they’re at a great price point too. 11. Moccasins – Minimoc is a long time favourite moccasin brand of ours. They have so many cute colours and styles and (the best part) they’re a Canadian company! I love these pebbles leather moccs, this shade is called “Glacier”. 12. Soothers – I’m excited for our little man to use these. They’re made of 100% silicone and free of toxins! Such a cute modern soother and they also double as a Teether! 13. Formula Pro – This is a new to us product by Baby Brezza that I’m really looking forward to trying out. We’ve had to formula feed in the past due to my low milk supply and I have a feeling this is going to come in handy! With just the quick push of a button it measures, dispenses and mixes the water and powdered formula to the perfect temperature and consistency for baby! Such a time saver. 14. Activity Centre – If you’re looking for a modern activity centre then you’ll want to snag this one from Skip Hop. It comes in muted colours that will blend in with your home decor and lots of fun gadgets to keep baby entertained. 15. Baby Bath – This Syki bath is perfect for newborns. I find the first month of baths stressful because baby is so tiny and fragile, this product is nice and narrow providing great support. 16. Bottles – The holy grail of bottles! We’ve dealt with reflux and gas with all of our kids and noticed such a difference in their comfort after we introduced the Playtex Vent Aire bottles. They reduce the amount of air your baby intakes while drinking their bottle and it was shocking to see what a difference they made. I won’t use any other bottle – this is not sponsored – we really love them THAT much! 17. Baby Carrier – I’ve been a long time fan of Solly Baby Wraps. They’re so comfortable for both Mom and baby, easy to put on and come in the most adorable prints and colours. You can even pick up a mini version so if you have an older child they can carry their dolls around while you carry baby, how cute is that?! 18. Mobile – We decided on a neutral mobile from Pehr because our bedding is busy with pattern but they have so many great options. Lots of woodlands themes, birds and pompoms. They’re a nice modern option if you’re going that route for your nursery. 19. Bottle Sterilizer – If you love products that save you lots of time then this is another one you’re going to love! The Baby Brezza bottle sterilizer and dryer naturally steam kills 99.9% of germs and can clean up to six bottles at once! 20. Play Mat – We’ve always had Fisher Price play gyms for all of the kids. They seem to really enjoy them for tummy time! Again, I love that this one comes in modern colours so it fits in nicely with our home decor. 21. Swing – This is another new to us product that I’ve heard really great things about. The Nuna LEAF Grow is great for infants to toddlers and even big kids. It gently shifts from side to side comforting your baby when your hands aren’t free. I love the sleek design and can’t wait to entertain our little guy in it. 22. Diaper Bag – this is another long time favourite! I had the pink Fawn Design diaper bag with Zoë and loved it so much I picked out the grey one for this time around. The leather interior is so easy to wipe out and keep clean and I love that you can wear it both as a backpack and regular crossbody. They also come in lots of beautiful colours, trust me, you’ll want to go check out their Spring line. 23. Bedding and Change Pad Cover – Oilo won me over with their adorable Llama print bedding. As soon as I saw it I had to pick it up for our crib and also the change pad. It comes in a Jersey Fabric that’s just so soft and if you’re not into the llamas they have so many other modern prints and patterns. 24. Baby Books – What goes perfect with baby snuggles? Reading! You can never start too early. I’ve linked to my favourite place to find baby and kids books – lucky you! They have a sale on right now! I’m not sure how long it’s on for but it’s a great time to scoop up some baby books for your little one. 25. Diaper Genie – Last but certainly not least…the diaper genie! This is an absolute must. We’ve always had one and couldn’t live without it. They completely hide the smell of stinky diapers and come in colours that easily blend in with your nursery. Let me know if you found this list helpful! In the coming weeks I’ll be sharing some similar posts like where I shop for urban baby clothes, our nursery inspiration and nursery reveal so stay tuned for those posts! Great post! Zoë looks so tall!